Interests: Machine learning, artificial intelligence, NeuroImaging. 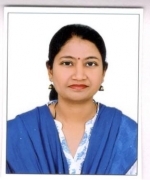 Dr. Kadambari has done her PhD from school of computer and systems sciences, JNU, New Delhi in the year 2011. Her area of research was computational neuroscience. Earlier to that,she completed her M.Tech (Computer Science & Technology) from Andhra University, Vishakhapatnam in the year 2004, and B.Tech (Computer Science & Technology) from PVP siddhartha institute of technology, Vijayawada. Her current works includes: learning feature templates using GANs, conversion of one musical instrument into another using GANs, finding biomarkers in depression using fMRI scans using deep belief networks, modeling language of thought using differentiable neural networks. Message : Never give up till you reach your goal in life. Machine learning, M.Tech(CSE) Ist year. Object-oriented programming, B.Tech IIIrd year, open elective. Operating systems, B.Tech IIIrd year(CSE). Object-oriented programming, MCA Ist year. Author Title Journal Name Vol. Page. Year. U.S.N. Raju, K.V. Kadambari, P. Venkata Subba Reddy A new method of assessing the students using video assignments IEEE's Global Engineering Education Conference (EDUCON), 2015, Tallinn Estonia. ACM's ICBBT '17 Proceedings of the 9th International Conference on Bioinformatics and Biomedical Technology, Lisbon, Portugal. Member of women protection cell, NITW.